We are using DNA methylation, bisulphite sequencing and expression analyses to establish the role of epigenetic effect in rendering phenotypic plasticity in both insect and rodent systems. Our focus is on conditions experienced in early life due to the profound impact on development and adult phenotypes. The overall objective is to establish fitness and developmental consequences of experiencing changes from early to late environment and associated differences in the epigenome. The prediction is that plastic responses to changing environments are rendered through modifications in the epigenome. The first aim is to determine the consequences of phenotypic plasticity for individual fitness in the context of changing quality of the dietary environment and habitat quality. Our second aim is to measure changes in global methylation in the brain associated with experiencing different early and late environmental conditions. 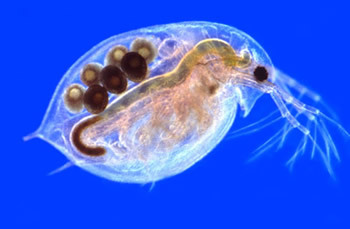 We are working with several insect systems such Daphnia, Diploptera and aphids. In collaboration with Joanna Neil and Jocelyn Glazier we are investigating the role of behavioural interactions in mediating cognitive development in offspring following maternal immune challenge during gestation. One of the fundamental questions in basic disease research is how stressors experienced during critical periods influence the development of adult disease. In particular, stressors experienced during pregnancy have been shown to have effects on the propensity to develop cognitive disorders in offspring. But is this because of a change directly affecting brain development in utero or is it because mothers change their parental behaviour in response to stressors, or a combination? Further, what are the mechanisms underlying such effects? The placenta plays a critical role in maternal-fetal interactions and fetal adaptive responses in utero which may lead to a propensity to disease development later on in life. 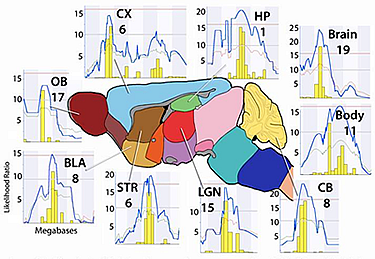 We are linking placental morphological development to offspring traits, achieved by combining experimental studies in a rodent model system with evaluation of placental morphological development, together with parent-offspring behavioural interactions, cognitive and behavioural analyses. This will be combined with histological investigations and molecular array studies. This will also be complemented by a bioinformatics component to unravel the biological pathways and genetic networks of known candidates for placental function and associated behavioural impairments. The genetic and epigenetic basis of quantitative traits involved in family conflicts and coadaptation. Here, we investigate the genetic and epigenetic basis of quantitative traits involved in family conflicts and coadaptation. Conceptually, the main focus of this research is on traits involved in interactions between family members and their underlying genetic and epigenetic basis. 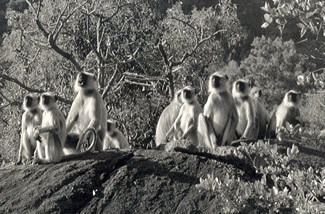 Interactions between family members are characterized by conflict over resource allocation (i.e. parent-offspring, sexual and sibling conflict) and synergistic or negative coadaptation between fitness-related traits. Previous empirical research has uncovered evidence for antagonistic coevolution between distinct life history traits in male and female mice as well as coadaptation between maternal provisioning and offspring maternal genotype. 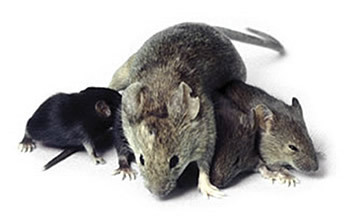 Using recombinant inbred mouse populations (e.g. BXD) we are currently investigating the genetic architecture of a number of different complex traits such as growth, maternal provisioning and behavioural phenotypes. Furthermore, we conduct research into the genetics of parent-offspring conflict and coadaptation between offspring and maternal traits to test assumptions and predictions of conflict resolution and coadaptation models. 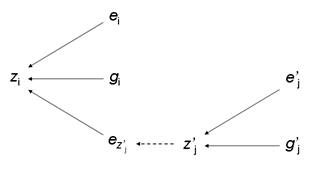 Indirect Genetic Effects: Sources of variation for a hypothetical trait zi. showing indirect genetic effects. 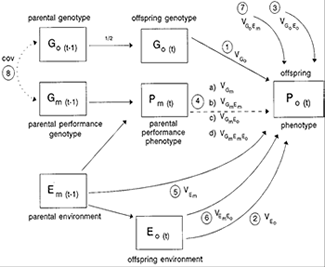 Variation in trait i is affected by genetic variation gi (direct genetic effect) and ei , the random environmental component. The indirect genetic effect ez’j caused by the phenotype of individual j, z’j also contributes to trait variation in the focal phenotype. From Harris & Hager 2009. Indirect genetic effects (IGEs) occur when genes expressed in one individual affect trait expression in a different individual. We seek to establish what traits are affected by IGEs during sibling and family interactions and how they affect adult phenotypes using the BXD mouse population. This project seeks to establish novel phenotyping protocols that allow the quantification of social behaviour for genetic analyses. A number of human disease phenotypes such as Williams Syndrome are characterized by abnormal social behaviours and we attempt to find analogous (or novel) phenotypes in the mouse model system in which knock-outs of relevant genes have been created. Using multigenerational experiments we are seeking to understand to how maternal environment influences individual development two generations later. We further use wild-derived mice that show unusual patterns of sociality and colonial living (WT: Mus spicilegus) with the aim to generate a population for genotype-phenotype mapping that allows to identify candidate genes for sociality. These projects are in collaboration with May Tassabehji, Manchester, and Robert Williams, UTHSC Memphis. This projects seeks to address the fundamental question of brain evolution: Is the structure of the brain into different regions due to differential selective pressures on different parts of the brain (the adaptationist view) or, selection on a specific part of on any single brain region would cause the brain to change as a whole due to developmental constraints (the developmentalist view). Together with Rob Williams and LuLu we are tackling this question using recombinant inbred mice that show genetic and phenotypic variation in key brain traits and investigate the underlying genetics of it using systems-genetics approaches. The focus of this project with Jason Wolf (Bath) and James Cheverud (Chicago) is on the role of genomic imprinting and maternal effects in complex trait variation. One aim is to develop and apply statistical tools to identify quantitative trait loci (QTL) across the genome for traits of interest and to assess the relative importance of genetic versus epigenetic effects for phenotypic variation in an intercross of Large and Small inbred mice. Most behavioural research is conducted in lab-housed animals due to the significant advantages of a controlled environment. In an effort to enhance the welfare and to obtain more realistic measures of behaviour, larger cages with an additional raised platform have been developed for rats thus increasing spatial complexity. However, the effects of this change in environment on behavioural patterns, individual development and maternal performance remains unexplored. Reproductive skew theory investigates how reproduction is partitioned between group members and under what conditions stable groups can be predicted. The key objective lies in understanding how reproductive skew theory can be used as a framework to interpret the evolution of animal sociality. To this end I have edited a book with Clara B. Jones on this topic for Cambridge University Press.